← Should all scientists really be militant atheists? There is some local interest in the Scottish ChildSmile dental health programme. Partly because anti-fluoride campaigners are promoting it to local bodies as an alternative to community water fluoridation (CWF). Their interest is possibly due to the opt-in nature of the programme which they see as satisfying there demands for “freedom of choice” (in this case the choice means excluding their own children from the programme which, after all, does include fluoride treatments). I have written about the ChildSmile programme before (see Fluoride debate: Ken Perrott’s closing response to Paul Connett?). But here is some more detail I have picked up from discussion online with health professionals. What is the ChildSmile programme? Data suggest that about 82% of three and four-year-olds are participating. The children who do not take part do not benefit. In addition to toothbrushing and varnishing, Childsmile involves health education initiatives based principally on public health nurses and health visitors attaching themselves to particular schools in order to give oral health advice to children and parents. Subject to parental consent, they also arrange for children who are not registered with a dentist to undergo check-ups and, if necessary, treatment. Is it a substitute for CWF? Not really, but health professionals see it as the “next best thing.” Appropriate for situations where there is no CWF. But it only covers children – and then only those children whose parents give consent (many don’t). In contrast, CWF benefits adolescents and adults, as well as children. Families can, of course, “opt out” od CWF (by using water filters or different sources), but numbers will be lower than those excluded by “opt-in” procedures. It is wrong to see such programmes as alternatives to, or separate from, CWF. Elements of the ChildSmile programme were already present before ChildSmile was introduced. Similar elements will also be common in countries like New Zealand. Childsmile was introduced in 2008 so it is a little early to judge its effectiveness. 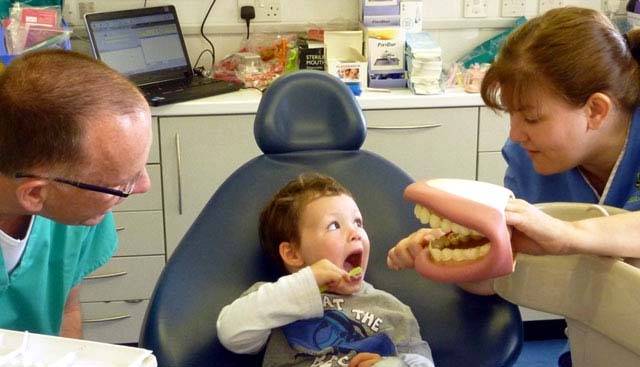 Scottish children’s dental health has improved and the programme most likely has assisted that. 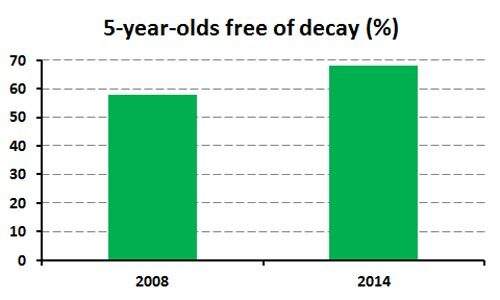 For example, 58% of five-year-olds were free of decay in 2008, compared with 68% in 2014. The average decayed, missing and filled teeth (dmft) score for this age group has fallen over that period from 1.86 to 1.27. However, there does not seem to have been a reduction in dental health inequalities between children from different social groups in Scotland. 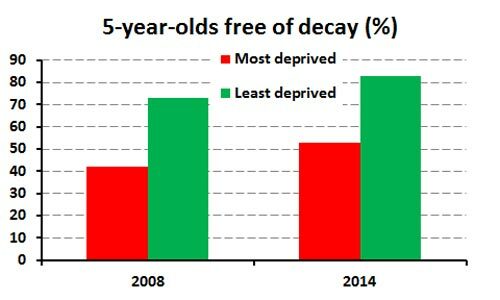 In 2008, 42% of children from the most socially deprived quintile of Scottish five-year-olds were free of decay compared with 73% of those from the least deprived quintile. In 2014, 53% of five-year-olds in the most deprived quintile were free of decay compared with 83% of those from the least deprived quintile. According to the Scottish National Dental Inspection programme the absolute inequality between the most and least deprived children remains at 30% (comparing percentages of children without tooth decay), according to surveys conducted in 2008, 2010, 2012 and 2014. Another concern is that children in the most deprived quintile of five-year-olds have not reached the national target set in 2010 that 60% of them should be free of decay. Of course, the ChildSmile programme has no effect on the oral health of current adolescents and adults. CWF serves 6 million people in England, costs around £2.1 million a year and is benefiting everyone with natural teeth, regardless of age, education or socioeconomic status. It benefits all children. So the cost per person of is around 35 pence per annum, although if we exclude people with no natural teeth it is likely to be a little higher than that – an average cost of about 40 pence per person benefiting. If we take a narrow view and assume only children and adolescents aged 0 to 17 (21% of the population in England ) benefitted from CWF the cost would apply to around 1.26 million out of the 6 million supplied with fluoridated water. On that basis, the cost of CWF would be £1.67 per year for each child benefitting. The total national ChildSmile budget for 2013/14 was £14,956,000, according to a statement by the Minister responsible to the Scottish Parliament in July 2013. This covers everything attributable to Childsmile – the toothbrushing programme, plus targeted varnish applications and associated oral health education initiatives. Assuming that around 120,000 Scottish children aged between three and six are benefiting, it works out at a cost of around £125 per child per annum. Compare the Childsmile costs of around £125 per child per annum with the CWF costs of about 40 pence per person per annum or even £1.67 per year for each child benefitting. CWF is obviously many times less expensive that ChildSmile. What is the attitude of Scottish dentists? The British Dental Association supports CWF and in Scotland has come out publicly to call for communities to move towards introducing water fluoridation. That position undermines the arguments of New Zealand anti-fluoridation groups claiming that Childsmile is an adequate substitute for water fluoridation. The professional body representing dentists in Scotland does not see it that way. The BDA in Scotland points out that CWF would be beneficial to children and elderly people. It argues that water fluoridation “would complement the Childsmile programme” by helping cut the overall burden of tooth decay and reducing dental health inequalities in the elderly. We could look at it another way and see that a Childsmile programme could complement water fluoridation. After all, we must remember that initiatives such as Childsmile rely on personal compliance and that they benefit only those taking part. They give no benefit for the rest of the population, unlike CWF. CWF and ChildSmile are are not mutually exclusive. Children in fluoridated areas should be encouraged to brush their teeth regularly with a fluoride toothpaste and to receive dental check-ups. Bear in mind, also, that components of a ChildSmile programme, such as supervised toothbrushing, were in use in parts of Scotland before the introduction of the full programme. Elements of the ChildSmile programme will also be in current use in New Zealand. Despite claims of anti-fluoride propagandists, the ChildSmile programme is not a simple alternative to CWF. And it is wrong to see it as such in New Zealand. It is far less cost-effective – the Scottish programme costs around £125 per child per annum compared with 40 pence per person per annum (or £1.67 per year for each child benefitting when benefits to adults are excluded) and therefore far less likely to be put in place as an alternative to CWF. ChildSmile is an “opt-in” programme so its coverage is far lower than CWF which is an “opt-out.” This is important when social differences in oral health are important. However, the contact between children and their families on the one hand and public health nurses, health visitors and dentists on the other, is very valuable and may have wider benefits than oral health alone. (I am thinking of problems caused by child neglect and abuse). I think these sort of programmes are socially very helpful and strongly support them. The cost is, of course, a limiting factor. However, elements of such social programmes may be possible within budget constraints that health authorities face. Health programmes like ChildSmile, or elements of that programme, can be very effective even in areas where CWF exists. They can give that extra boost to the oral health of children and can, therefore, complement CWF. There are many areas where CWF is not feasible because of low population density, lack of suitable water reticulation systems or local political opposition to CWF. I believe that programmes like ChildSmile, or parts of that programme, can be very helpful in those situations. Northland and particularly NZ’s Far North are obvious examples. Finally, let’s not be diverted by the programme name. I am sure that elements of the Scottish ChildSmile programme are already in place in New Zealand, or parts of New Zealand. Given the costs of such programmes, and budget limitations, these programmes do have the advantage that they can be targeted to regions or social groups where the need is the greatest. This entry was posted in Health and Medicine, SciBlogs, science, Science and Society and tagged ChildSmile, community water fluoridation, fluoridation, fluoride, SciBlogs, Scotland. Bookmark the permalink.